Lib-Chip's RFID Lib-Scan handheld unit, is a lightweight, portable, battery powered, read-write and data processing terminal comprising a small handheld computer and an ultra lightweight antenna. The ergonomically designed unit with a powerful computer is connected to a lightweight antenna via a fine cable or Wifi. By designing our system in this way we overcome the notorious problems of arm muscle fatigue caused by the excessive weight also the lightweight antenna enables easy access to items on high or low shelves without the need to bend over or stretch. 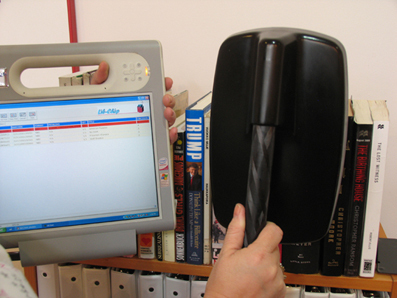 Ease of use combines with comprehensive functionality - making light work of inventory checks, stocktaking, tracing misplaced items, weeding, searching for specific items and (re)programming of RFID tags and even checking in- and or out material are functionalities that are standards in the Lib-Scan software.